The Bay Area may be losing a bit of its luster. After years of being overrun by new residents drawn by a red-hot economy, the number of people moving out has begun to catch up with the number moving in, new census data show. In fact, in some parts of the Bay Area — including Santa Clara, San Mateo and Marin counties — already more people are leaving than arriving, according to the estimates released Thursday, which cover the period from July 1, 2015, to June 30, 2016. The same would be true in San Francisco if it weren’t for the high number moving in from abroad. Such a trend has not been seen since last decade’s recession. The region’s economy, by all measures, is still robust. What’s happening, say Johnson and other demography experts, is that the extraordinary upswing that led California out of hard times last decade, with the tech sector propelling the boom, has become slightly less alluring. At the same time, housing prices have continued to grow, compounding the crunch. 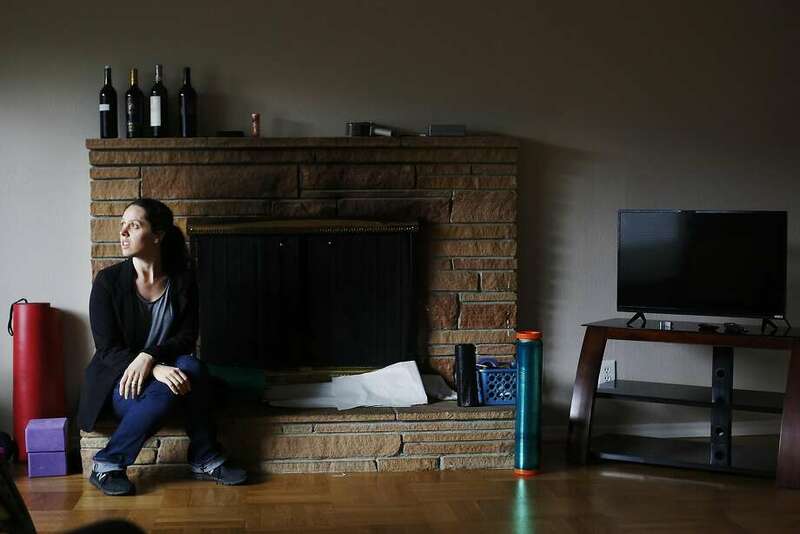 For Redwood City resident Lolly Mitchell, 29, the scales have tipped on the side of cost. The hardware engineer, whose husband is also in the tech industry, has been saving to buy a home but finally decided that Bay Area prices are just too much. The couple recently closed escrow on a house in Los Angeles. “I moved up here because there was more work for my husband,” said Mitchell, who came from Southern California. “We’ve been working hard to be financially secure here. But we don’t want to live paycheck to paycheck. We just don’t want to be at risk for the amount of money we’d have to pay” for a new home. The median home price in the Bay Area was $784,500 last month, according to the California Association of Realtors. In San Francisco, it was $1.28 million. Homes in San Mateo, Santa Clara and Marin counties also averaged more than $1 million. While prices have not been growing as fast as they were a few years ago, when double-digit appreciation was not uncommon, and the number of sales has begun to drop, real estate values are still ticking upward, the association’s data show. The new census data show that eight of the region’s nine counties, with the exception being Solano County, experienced their lowest levels of net migration — the number of people moving in minus the number moving out — last year in at least four years. Some haven’t seen numbers as low since the recession, when jobs in the Bay Area, like elsewhere, were harder to come by. When considering only people coming and going from elsewhere in the U.S., most Bay Area counties, including San Francisco, saw greater outflows than inflows. But sometimes influxes of foreigners offset losses in the domestic population. The number of births also tempered migration losses. 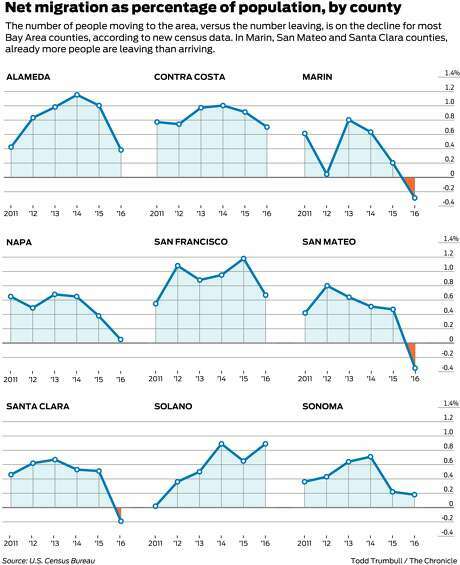 Marin was the only county to actually lose population. Overall, the Bay Area’s population grew 0.7 percent to 7.68 million in the time period, the data show. Santa Clara County had the most residents, with 1.92 million people, followed by Alameda County, with 1.65 million. San Francisco counted 870,887 people. Solano and Contra Costa counties, where real estate prices tend to be lower, saw the most growth, 1.4 percent and 1.1 percent, respectively. The new census figures do not include demographics, such as race or income, of the people moving to and from the Bay Area. Nor do they track where people are coming from or going to. Demographers looking at real estate records and tax returns have found that the exodus often begins in California, with people moving within the state from more to less expensive regions. The nearby states of Oregon, Washington, Nevada and Arizona have also been popular, as has Texas. A LinkedIn report this month cited Portland, Ore., as the top destination for its Bay Area users leaving the state. Todd David, executive director of the San Francisco Housing Action Coalition, which advocates for making the region more affordable, said it’s not just poor people who are finding it expensive to live here. While the likes of Google and Apple continue to create jobs — both plan to open new, sprawling campuses locally — many companies are not keeping up. And few offer salaries commensurate with Bay Area costs. State data show that January’s job growth hovered just above 2 percent for most of the Bay Area. That’s down from closer to 4 percent a year ago and nearly 5 percent two years ago.